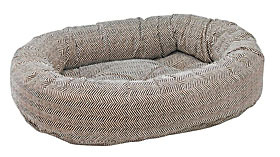 This plush bed surrounds your pet in comfort. The Donut Bed looks great after every wash, lasts for years. Unique, 2-piece design. Removable inner mat. The mat is tufted, creating an upholstered look and preventing clumping. 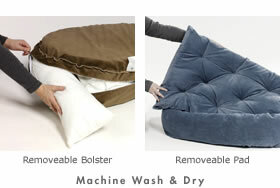 Removable, washable outer cover. The Donut Bed is made in their signature microvelvet & other great fabrics. Cleaning: Unzip cover and remove inserts. Rezip, machine wash cover on cool on gentle cycle. Inner mat can be washed as a whole. Tumble dry. Custom: Please contact customer service for more information. Allow 4 + weeks for custom orders to ship. 31" x 19" x 7"